Complete Pain Relief may be an adjustment away! 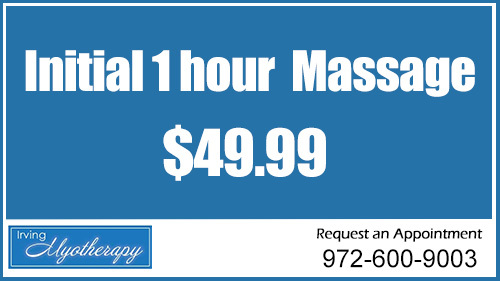 Click here to learn more about Chiroractic Massage Therapy. We would like to take this opportunity to thank you for choosing Irving Myotherapy for your care. Irving Myotherapy is your one-stop healthcare center for learning about what chiropractic care is and what it can do for you. We are your DFW neighborhood chiropractor provider and we believe in a total body, holistic approach to healing. We strive to get you well and keep you healthy. This means we don't just treat your symptoms. We review your health history and provide you with a thorough examination to help us determine your healthcare needs. Based on the results of your exams, we then develop a treatment plan that fits within your lifestyle... One that will help you reach and maintain optimal health. Our mission at Irving Myotherapy is to provide affordable, high-quality DFW chiropractic care to people of all ages. You can benefit from Dr. Soberanis chiropractic approach because he enjoys educating our patients about his knowledge and empowering them of Myotherapy, Chiropractic, Massage, Exercise and Nutrition in order to help with many common health problems and/or for them to assume a more active and responsible role in restoring and maintaining their own health as well as the people around them. We understand that although our patients may be diagnosed with the same condition, they respond very differently to treatments. For this reason, we tailor a specific plan of action to meet your needs, goals & unique medical and physical condition. What Can I Expect During My First Visit with Dr. Soberanis? Depending on your condition, Dr. Soberanis may schedule a series of visits for care. Relief May be just and adjustment away! !